*The kanji for this attack and the furigana for this attack have slightly different meanings. The furigana spelling is listed here, and it is also what Alphamon says in X-Evolution. It essentially means Ultimate Vanguard King Dragon Sword. 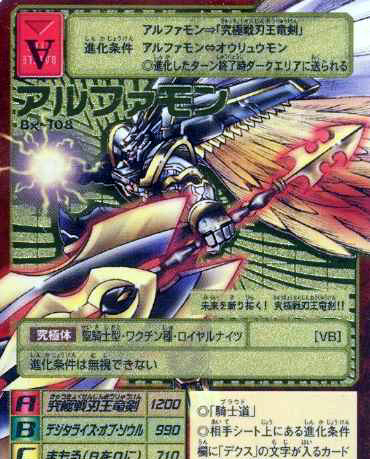 However, the kanji for this attack means Ultimate War Blade King Dragon Sword, which is the translation I use to differentiate this Digimon from normal Alphamon, for the attack, and for the option card.